Preheat oven to 350 degrees F. Line an 8x8-inch baking dish with foil; coat with cooking spray. In a medium bowl, stir together graham cracker crumbs, sugar and melted butter until well combined; pat into bottom of baking dish. Bake for 10-12 minutes or until golden brown. In a medium bowl, using a mixer on medium speed, beat together cream cheese and marshmallow cream until fluffy - about 1 minute. Beat in cocoa powder, vanilla and eggs until combined - about 1 minute. Stir in melted chocolate until combined. Pour filling over crust, and bake for 25-30 minutes or until set, and no longer wobbly. Remove from oven. Preheat oven broiler. Evenly top cheesecake with mini marshmallows. Broil for a few seconds until marshmallows start to brown. Cool on a wire rack (drizzle with additional melted chocolate, if desired). Place in the refrigerator or freezer until well chilled - about an hour or two. Lift out foil from dish and slice cheesecake into bars. 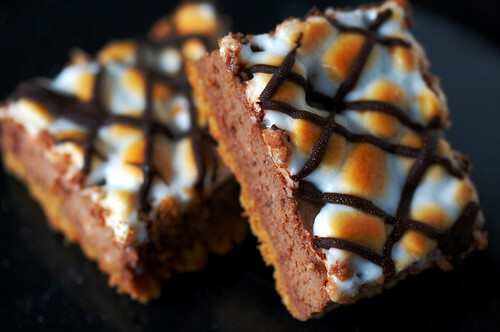 45 comments on "S'mores Cheesecake Bars"
you are a genius!!! those bars look amazing! hahahah i laughed out loud about you being cold in 68 degree weather. where i live (portland, oregon) it was like 15 degrees today! So. cold. Well where do I begin...with the fact that you need to get Eric soft flannel shirts and pants for Christmas, your delicious appetizer or these fantastic brownies!!!! I love everything about this recipe. Graham crackers! Marshmallow! Chocolate! Cheesecake! It's all too good to be true. Printing recipe now. Yum! I'm always cold too - I was even blue when I came out of the womb. Poor circulation, always :) Oh and it's 14°F here, so THAT doesn't help. Brr!! Stay warm. Perfect WARM campfire-esque treat there! Those are such stunningly *edible* photos! 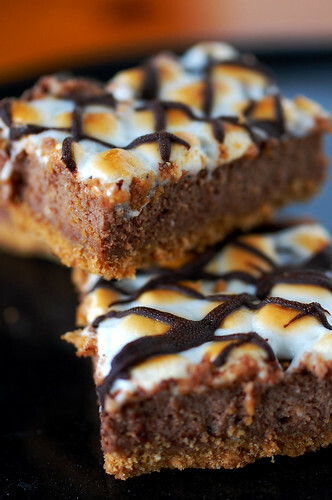 The marshmallows are just the perfect amount of toasty on top. I love them! Oh my gosh, I love flannel shirts and funky old man hats. Next time, just ask for their hats and shirts instead of a tip...I dare ya. I'm always cold too. It's the temps drop below 50, I wear long underwear, and my brother jokes that I should just strap a space heater to myself. I'm all about the artificial sources of heat. I do declare that I'll need to make these ASAP. Those look amazing! You always create the best treats! I eat those darn gummy vitamins like candy too!! Maybe you're not getting enough protein? I dunno? I think I read that somewhere. These look yummy!! I'm still thinking about your Oreo Cream cheese brownies that I saw last night. Unfortunately I have no Oreos in my house at the moment and I'm not going grocery shopping till Tuesday so . . .
Voted for you! Who can turn down mac and cheese balls? Um, hello delicious! Those look spectacular, am going to make them for a cookie party coming up. Thanks so much for the great recipe and photos! These look fantastic! 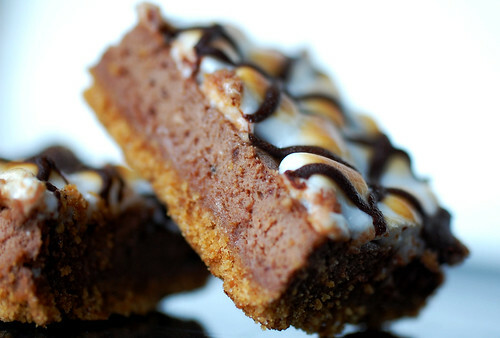 I love s'mores and cheesecake, so I bet I would love it! okay i can totally empathize with ALWAYS being cold. it's terrible! i was in cleveland the past few days and it was sickeningly cold. i was miserable! Oh my. I wish you hadn't invented that! I'm afraid I'm going to have to make them and then I will end up eating most of them myself! These look incredible. I love to see and try the recipes you have invented. You are amazingly talented! Best of luck on the appetizer contest! I bought some of those gummie vitamins today, and was so excited about them even though they cost an arm and a leg! So I ate one, and it was good, and then came the taste it leaves in your mouth. Do you get that taste? It's weird, and I have to drink something afterwards to get it out! Hmm maybe it's just me. I also am freezing all the time! I bought some really good socks called Smartwool and they are amazing at keeping my feet warm. You should try them! yumm i love smores!! great post girl! i, too, am always cold. ny is clearly not where i need to reside. great bars, of course--anything topped with toasted marshmallow is bound to strike a chord with me. Okay I voted for you. I wonder if I can vote with both my FB and my MySpace accounts. They look aretery-cloggingly delicious. This cheesecake looks pretty delicious too. I love s'mores flavored stuff. My grandfather had a plaid flannel shirt. It shrank in the wash too much, so he gave it to me. 15+ years after his death I still have it. I'm just like you...I'm always cold! Since I grew up in the Phoenix area, I usually blame it on that...but I think it's also bad circulation, which I don't get cause I'm active. I'd take a summer day in Phoenix over a cold weather, anytime! 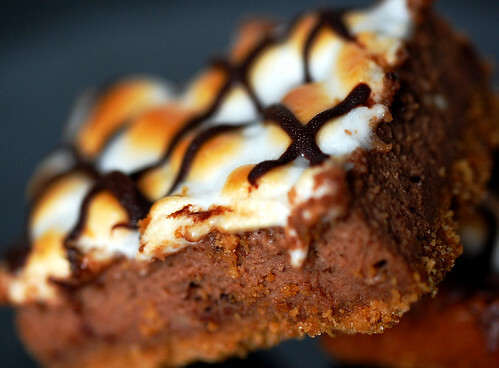 S'mores cheesecake? Oh my! Love the cleanness of the squares you've cut! I know what you mean about being cold - I'm always the cold one! I "starred" you and posted to my Facebook page. Those little bites look really, really yummy. I love white cheddar in macaroni, in fact the year I won the grand prize at Tillamook it was with a white cheddar macaroni. Hope you win! Oh, and your pictures are amazing! Yum! I should never come here when I'm so hungry. LOVE these bars!!! They look perfectly creamy and delicious. Are you baking up things just for my liking!?!?! This is right up my alley! YUM! You never cease to amaze with your beautiful photos and wonderful recipes. Thanks girl! These sound AMAZING. Why have I never paired marshmallow creme with cheesecake before? Oh, and I'm always cold. 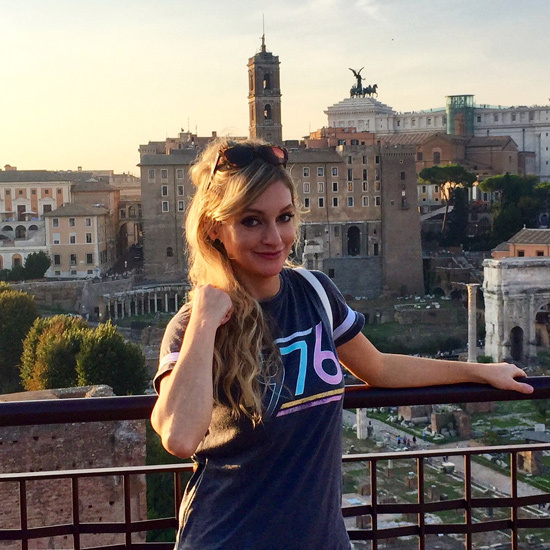 Living in CA for seven years completely spoiled me, and now anything below 60F is cold. Thanks everyone! Thanks for the votes, too. I don't think I'll win, but ah well. Mona, it really does! I wish I could put browned butter in everything. Veggiegirl, oh my! You poor thing! Heather, thank you for voting. I'm allll about artificial sources of heat too. Rice pad! They're the best. Dumbwit Tellher, thank you for sharing! I appreciate that. Natalie, are gummies the BEST? Erica M, all I taste is sweet, sweet delicious gummie vitamin. I'm not sure why brand it is. Sarah, thank you!! And thank you for telling me about the contest! Rachel, I love that story. Thank you for the votes. Lorie, thank you, thank you, thank you. I appreciate it. I don't think I'll win though. Ohhhh well. Very sad. Hey! We both started out our posts talking about weather. Did you notice that? These bars look amazing! And of course I will vote for your recipe - like you say, it can't hurt. These look almost too good to eat. Genius Em!! Anything that includes chocolate and cheesecake is a winner to me!! Yummy, those are beautiful. I love the drizzled chocolate on the top. Nice touch! I've made a s'mores cheesecake but not bars. The cheesecake was really good but I'm digging your bars. Did I read marshmallow fluff in the filling? Oh, yeah!